Yep, we have a Sci-Fi contest on our hands, with a week to go until entries are due. There are amazing prizes for the best Sci-Fi build, but in the spirit of the Internet, a few teams have elected to put together a science nonfiction project. We won’t hold that against them, because these builds are really, really cool. First up in the ‘real life science fiction’ category is an adorable little rocker bogie robot designed and built by a team at MADspace, the Eindhoven Hackerspace. A rocker bogie suspension is rather unique in that it can be used to drive over obstacles twice the size of the wheels, has a zero turning radius, and is found on every rover that has ever gone to Mars. The suspension system has articulated rockers on each side of the chassis , with pivoting wheels at each of the four corners of the robot. While this type of suspension can’t go very fast, it can go just about anywhere. 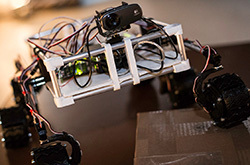 The team loaded up their bot with a Raspberry Pi, a pair of webcams, 20Ah of batteries, gyro, and a web interface. The suspension works beautifully, and most of the parts are 3D printable. Very cool. There’s a pair of videos with this bot in action below. Spider bot. Just add two more legs. Continuing on with the science nonfiction theme of this post is a cute little hexapod walker reminiscent of designs that have been proposed to visit the moon and asteroids. This is a rather unique hexapod, controlled entirely with 12 PWM channels on an ATMega1284. Although each leg only has two degrees of freedom (the software has support for 3 DOF, though) the movement is surprisingly smooth. It’s an inexpensive build, too, with 5 gram servos providing all the power to the legs. Video below. ← Need An Idea For Your Next Kickstarter? Check Out This Kickstarter! Now make a hexapod with a rocker-bogie suspension. Save two servos by putting them on the rocker joints instead of each leg.